a number of defensive structures that began to be built after the Muslim conquest of Spain in the eighth century, but especially during the final centuries of Islamic rule. The structure and function of these fortifications was very different to that of feudal castles established after the Christian conquest by James I. However, in many cases the Christian newcomers took advantage of previous Islamic constructions, and adapted them to new requirements, i.e. to control a mountainous, newly conquered territory occupied by a majority Muslim population, and to provide support and symbols of power to the new feudal order. 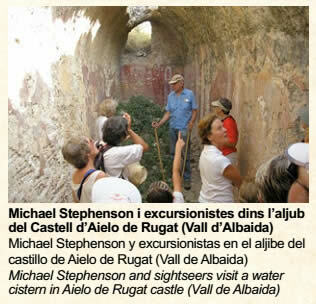 The stimulus for this exhibition was the donation to the Museum of Xàbia of an important set of plans and photographs of more than fifty Valencian castles- several of them from the Marina Alta - which had been made since the 1990’s by Michael Stephenson and his friends Anne Scott and Ted Adams. The exhibition is made up of fourteen panels that cover the defensive architecture of this, our part of Sharq al-Andalus. The exhibition begins with an historical introduction and characterization of Islamic castles, followed by a description of the more primitive fortifications in the region: the Bastida (Pego), the Cocoll (Castell de Castells), the tossal Pere Antoni (Beniarbeig, Sanet i els Negrals) and Xillibre (Vall de Gallinera). The castles and towers of the Marina Alta are described from north to south, starting with the impressive fortresses of the Gallinera Valley: Alcalà castle, Castellot d’Alpatró, Penya Foradada tower, Forna castle and Gallinera castle. Followed by Ambra castle (Pego), Segària castle (Benimeli), Blanc de Morell tower (el Verger), the Ocaive castle and Benimarmut tower (Pedreguer) and the watchtower of tossal del Moro (Gata). Further inland, in the Laguar Valley we find the Plana or Atzavares castle, the Casota tower and castle of Orba. Then in the Xaló valley there are the castles of Aixa and Pop, and in the extreme west, in the headwaters of the valley, Serrella Castle (Castell de Castells). To the south, there is the castle of Calp, known as the Mascarat, the castle of Berdia (Xaló) - right on top of the Sierra Bernia - and the tower of Canor (Benissa). In Xàbia, the tower of Capçades is shown as being the only defensive structure from the Islamic period to be preserved within the municipality, while others are named which have now completely disappeared. The exhibition ends with a brief note on Michael Stephenson.